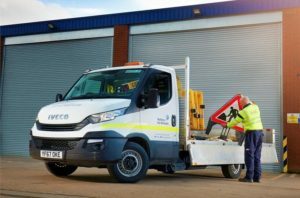 Iveco has supplied two 3.5-tonne Daily Natural Power chassis cabs to Northern Gas Networks, both running on compressed natural gas (CNG). Supplied by Iveco dealer Northern Commercials, based in Brighouse, the chassis cabs are in addition to the Daily Natural Power that has been operating successfully at the main depot in Leeds since 2017. The new vehicles are powered by a 3.0-litre natural gas engine delivering 136 hp and 350 Nm of torque, the same outputs as the diesel equivalent. IVECO claims the engines are 50 per cent quieter, making it ideal for Northern Gas Networks’ 24hr operations. The vehicles also benefit from much of the same technology found in IVECO’s new Daily Blue Power LCV range, which has been named International Van of the Year 2018. Both vehicles feature dropside bodywork by Advance Commercial Bodies and have a reversing camera system, payload indicator and roof-mounted beacons to increase operational safety and visibility. They will be among the highest mileage vehicles on the fleet, clocking up around 15,000 miles annually during their projected six years in service. The vehicles will be refuelled at a CNG station in the Aire Valley, with Northern Gas Networks opening its own dedicated refuelling facility later this year (2018).